A few months ago, I expressed a bit of joy over the convenience of the Pandora app on my iPhone and their “strike while the iron is hot” marketing activity. However, no matter how much I love music, I have fallen into the bucket of someone who has not used Pandora recently. In fact, it’s been a few months since I last used it online or via my phone. Sure, I’ve heard my friends discuss how much they love Pandora from time to time on their Facebook posts. I see other employees using it as I walk around the interlinkONE office. But for me, I just didn’t seem to find the time to launch and listen. Well, while I may have “forgotten” about Pandora, they did not forget about me. 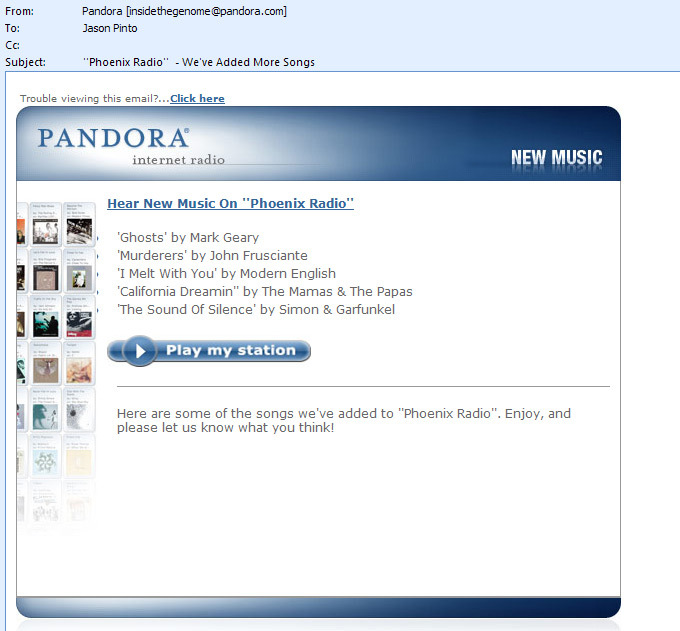 Two days ago, I received an email from Pandora. It wasn’t pushy… They didn’t ask “where I’ve been”. But rather, they provided enough of a gentle incentive to make me want to launch and listen one more time. The email simply let me know that they had added songs that I might like to one of the playlists I had created in the past. This type of content did a couple of things: one, it reminded me about why I loved Pandora — they help people discover new music! Two, it put the service in the front of my mind, which caused me to help move it up in my “things to do” priority list. When it comes to your marketing efforts, you may also have a list of people who you view as “inactive subscribers”. Perhaps they haven’t opened one of your eNewsletters in months. Maybe they have ignored your invitations to listen to a webinar. But no matter what, the good thing is that they are still on your list. They have not yet opted out. We must not view these types of contacts as lost causes. Rather, we should creatively find ways to re-engage them.